Playing Baroque Recorder | Rejoice! What I love, is music. For much of last year I fought a loosing battle to keep up enough puff for woodwind instruments which I have been playing, on and off, since I was eight. At that age it was simply the school recorder; but our music teacher was nothing if not keen about recorder playing. By the time I left school a decade later our teacher had progressed from “preparing” the upright piano as a harpsichord with thumb tacks in the felt hammers to bringing a spinet to school in the back of her car; and a quartet in which I played had performed in the Opera House and won a 2nd in the City of Sydney Eisteddfod. Only a couple of years ago I began taking music lessons once again, and I have written several times in these pages about the joys of playing baroque recorder. Perhaps it was the vaguely realised sense that my musical tenure was inexorably waning that propelled me to play in two ensembles and an orchestra every week, with at least an hour a day practicing the many new pieces our director challenged us with. It was a busy life on the busses heading to and from lessons and rehearsals, and best of all a concert now and then. The humour and intellectual stimulation of each visit to the Conservatorium was glorious. Halcyon days, indeed! Can you see me in the back row? Early last year I perfected a technique of playing with the breathing mask in place – not a simple trick balancing delicately tongued diaphragmatic airflow into the instrument with 1.46 KPa of air pressure going up your nose! Afraid that I might finally loose my place in the orchestra I briefly took lessons in two different non-wind instruments, but the sounds were not pretty. Eventually, despite several attempts at denial, reality had to be admitted. By the middle of term 4 I was only practicing on alternate days at home, each rehearsal took several hours to recover from, and a performance set me back for days. It was untenable. Instinct led me to reach for a decision while we were at sea in November. The thrill of that week gave me a perspective from which I could think calmly and clearly, without the entanglement of maudlin emotion. I put down various thoughts in my journal. I decided that I would finish playing at a point of strength, rather than turning gradually into the bumbling guy in the wheelchair that can’t keep up. I realised that I must be resolute. I set a day on which I would reach a decision, and having done so I wrote an email onboard the ship to the Conservatorium back at home, and drafted a letter of appreciation to the teachers with whom I had shared so much. This week past, had my path been otherwise, music would have resumed once again. I admit to a temptation to despair, to weep for myself, to indulge in sorrow: there is so much that I miss. I could easily go down that path … but to do so I would have to turn away from something bigger that I feel inside. Just what that bigger thing might be is elusive; but it is hopeful, joyful, and almost always there if I take the time to be quiet. I think it may be gratitude. Gratitude dispels attachment: it’s much easier to face not running on the beach with my kids when I remember the many, many times I have. In a similar way the choice I make to look ahead and move on is a strong claim on the ground behind me on which I once stood. And I have those that love me. Always glad to hear from you…. With thrill and mild terror I am waiting at the back of an auditorium while the able bodied members of the orchestra – everyone else, it seems – set out chairs, move the grand piano, assemble instruments and pass out music. The piano lid is propped up high; the big double basses come out of vans and are wheeled in the side door. I’m hiding against the back wall, looking studious and hoping my inactivity is not too obvious. I’ve never in my life performed in an orchestra, this is exciting! The conductor wanders past muttering numbers. Not the usual count, One-two-three-four, he’s up in the 70s. Chairs, I realise. He has the difficult decision: how many are coming? The audience begins wandering in. All ages, but many are clearly parents with younger siblings in tow. The grey ones are grandparents, casting around the room for a grandchild that has grown half and inch and changed their hairstyle. Half the orchestra is my age, give or take a decade or two, and half are enormously talented school kids. I will be playing bassoon, a very close relative of the beloved oboe. Oh, Oh Oboe! Strictly speaking, in the interest of full disclosure: it says bassoon on my score, I am playing the bassoon part, but not quite the bassoon itself. When it comes to the matter of actually blowing, it will be my bass recorder. None the less! Ten minutes before we begin an extra row of chairs is put out. And another! Very promising. Five minutes left and nearly every seat is full. Favourite Wife and Teen Girl have been shopping while we prepared (no surprise there) and now they are back to find a seat. There is a gentle murmur in the hall, gradually rising to a buzz of anticipation. I’ve been to many concerts, but I have never felt like this. My childhood was peppered with concerts, or “the symphony” as my grandmother called it. I lived with my grandmother and great aunt for some of my teen years, and on the first Friday of every month they hosted a dozen or more of their school friends; having spent their whole lives closely connected. I sat in on the gathering now and then. We ate cucumber sandwiches with the crusts cut off. My grandmother used to freeze sliced bread, and then cut each slice in half, through the crust, to make the bread thin enough for this delicacy. Most of these older folk had season tickets to the Sydney Symphony Orchestra, and on account of their advancing years there was frequently one who could not attend. Which was my opportunity. I can’t easily forget the many long taxi rides into the city, wedged in the middle seat between fox fur and lavender. But arriving beneath Sydney Opera House and joining the dignified throng milling up the grand staircases dispelled all discomfort. Men wore dark suits, some carried silver topped canes, even the odd top hat was still to be seen. But no orchestral concert felt at all like this one. This time I am utterly invested in each tiny detail. I cant believe how good we all look! And the inspired sparkle in the instruments warming up is impossible to miss. The opening item, a young string group, play beautifully; and the odd poorly tuned bar hardly rates attention as I feel so keen that they should succeed. I first heard this orchestra, the junior orchestra at the Conservatorium in our city, on a cold, wintry evening only ten weeks ago. Woodwinds are becoming more taxing to blow as the months pass, and I was so energised by the performance that I conceived a whole new musical chapter playing 2nd violin. You may perceive a pattern here, harking back to a certain woodwind beginning with O. Having rashly purchased the O instrument outright, this time around I more cautiously hired a violin, enrolled at the Con, and got the shock of my life. I have been playing instruments and working with all manner of tools and machines most of my life, but I have never held in my hands anything as alien and awkward as that violin. The second violin part suddenly looked much less promising, and there being no call for a seventh or even an eleventh violin section, I packed the awkwardness of horse hair and cat gut back in its box. But I had, at least, given it a go. My teacher – I am so grateful to him – was not the least concerned by my erratic flights of musical fancy, and simply suggested instead that I play Faux Bassoon. I’ve been practicing with the orchestra for just a few weeks now, entering an entirely new world of counting rests for a dozen bars, playing a flying run of semiquavers in very strange intervals, resting five counts, playing six and a half minims, and so on. The joy of being immersed right in the midst of this live, thrumming, beautiful sound is overwhelming. And suddenly the audience is quiet, something is about to happen. A highly inappropriate and profane use of Matthew’s description of Christ transfigured on the mountain, no doubt, but nothing comes to mind that captures so well the transporting, fulfilling thrill of that concert performance. It was a shining, glorious moment; time seemed suspended, and for days I walked on and on in the light of that moment. In fact I can still immediately summon the brightness of the recital and bask in its joy. Lest you think I am boasting too much; this will bring us all back to earth: Just a dozen bars into the first tricky phrases of a solo piece I stumbled badly, completely stopped playing, and apologised to the audience. Not classy at all. Fortunately my music teacher had drilled me in beginning the piece over and over from several different ‘rehearsal marks’ for just such a moment; and so I was able to pick up again and from then on the piece went very well. Except for one other little two year old detail. My grandson was in the audience. In our home he often travels on my lap as I roll up and down the hall doing tasks about the house, so when I rolled down the aisle to take my place behind the music stand, he wanted to come too. Furthermore, at home when I play recorder I give him a plastic descant to toot along with (he’s very good! ); and so during my solo piece he had two points of grievance with me. As I played on after my false start I was vaguely aware in a minuscule pocket of concentration not required for music that my daughter was trying to keep him quite. I could vaguely see her, just above flights of semiquavers on the score, standing up with him and eventually walking straight toward me, turning left in front of the music stand, and leaving the room. On I played! Here it is, played by a master, Aldo Bova. It re ally did go well, and it was well received. Towards the end of the piece I felt my concentration shift towards listening to the sound, rather than the technical task of creating it. I have heard musicians describe this experience of intense concentration seeming to move them to being observers of their own performance, sometimes even from above. The following day the teacher sent me the most generously worded review of my performance, which I won’t reveal, but which will stay with me as a gold medal of sorts. Deeply satisfying. Following the solo I played the bass part in two Telemann trios; one with another adult recorder student who is a highly accomplished sax player and teacher at the Conservatorium. He was brilliant, superb. The great trouble with most mountains is that they seem to place themselves, for reasons I don’t understand, right beside valleys. So problematic! But not the mountain I am on. Perhaps it’s a Mesa, one of those enormous flat topped giants, and the cliff edge is out there somewhere, waiting for a careless step. But I think not. It was transfiguration, and it came not just from two years of daily, often lengthy instrument practice, nor from the tuition of an excellent teacher, nor from a generous audience – though all those things contribute. It was bigger than all of that. A flawless performance of a Telemann Fantasia performed in private would not have remotely the same reward. It interests me that Christ met his transfiguration in the company of three friends, and tellingly the heavenly voice speaks from above the mountain, “this is my beloved son…” Transfiguration, whiter that white, belongs in a myriad of different expressions to people who live, work and strive together; family, friends, community; combining talents and effort, pursuing something grand, discovering something boundless. Oh, Oh, Oboe, written several months ago, was not the end of my adventure in the woodwinds. Indeed, the sequel is a too-good-to-be-true story. 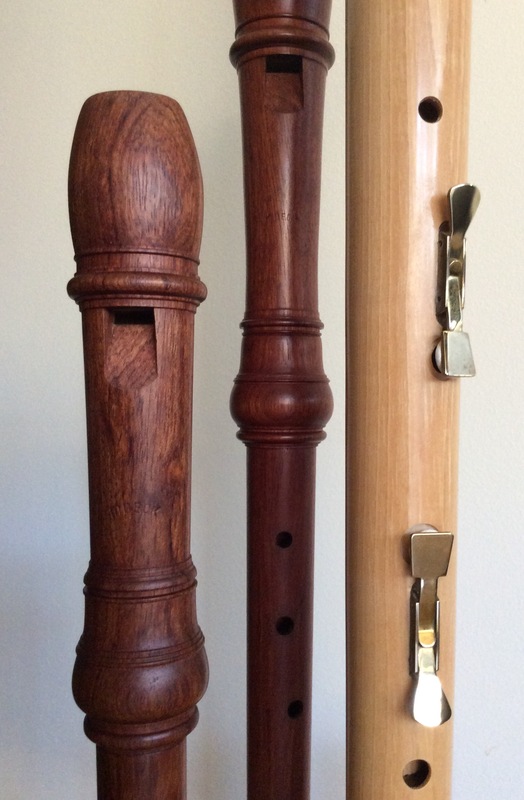 Once the Oboe, beloved friend, had gone to a high school orchestra (incidentally, the young oboist’s father contacted me to say he was doing very well) I turned back to the Baroque Recorder. This grand phrase, ‘Baroque Recorder’, is the way my woodwind teacher likes to distinguish what we play from the School Recorder, words which cause some folk to relive traumatic experiences amongst a gaggle of screeching plastic weapons. With the proceeds from the Oboe I ordered a good instrument from Germany which duly arrived but didn’t live up to my expectations, so back it went to the fatherland. A few weeks later I happened to look on Gumtree quite late one night, just to keep an eye out for woodwind instruments that occasionally pop up. My eyes almost popped out. Someone in Western Australia was selling a complete set of five recorders: Sopranino, Descant, Treble, Tenor and Bass. Not just any recorders, but Rottenburgh recorders by the German maker Moeck. If you were a recorder aficionado you might emit a low whistle. The asking price was well within the proceeds of an almost new Oboe. It was such a startlingly impossible opportunity that I felt paralysed by an irrational certainty that they must surely already be under offer, or just plain SOLD. Was it actually worth making even the slightest emotional commitment to these instruments by enquiring? Or should I just save myself the pain, and keep looking. I sent an email right then, very late at night, and tried to sleep. In vain. 8am, no reply to my email. It being almost a reasonable hour to ring someone in WA, I called the mobile number to find, wonderfully, ecstatically, that they were still for sale, and had been for 9 days without any interest at all. The owner was from a rural musical family, and was “cleaning out some cupboards”! These are they, glorious Moeck Rottenburgh recorders. Playing these is sheer joy! Eighteen months have passed since I began recorder lessons; I hate to think how much time I’ve spent going up and down scales and over and over and over tricky passages. So many, many hours! My style of learning throughout life has been plain old slow; and to get a passage firmly under my fingers I seem to need dozens of repetitions. But it seems to work, and I’ve played in several small concerts now, usually rather poorly due to ridiculous levels of nervous tension. I’m very privileged with teachers; last year I was being taught by the director of the conservatorium, and this year I am with another teacher who is something of a specialist in Baroque music and the bass recorder, which is my main instrument. For half an hour before my lesson both these teachers and I play trios together, which I really don’t understand because I’m nowhere near their standard. But it’s fantastic fun! There is even talk of a concert item. It wouldn’t be a proper edition of Rejoice! if I didn’t engage in a little introspection (which must annoy some of my readers endlessly) so here it is: Amidst the great excitement and satisfaction that music brings, I sometimes think all of it is a monstrous waste of time. This is the comment of my Inner Protestant, who has a serious work ethic to uphold. I’ve been a slave to this all my life: every moment should count in some significant way that benefits all of humanity. It’s a vain and foolish paradigm, but deeply embedded for some reason. At another level I’m sure that the rigorous breath control required does me a world of good; so much so that I suspect that it actually keeps me going. At yet another level, I aspire to something lofty. I have this hope that creative beauty might be more than an end in itself. While this may simply be my Inner Protestant having another go, trying to rationalise and subvert pleasure, adding merit to delight, I can sometimes play a transcendent note. Synesthetes, they say, see shades of colour when they hear musical notes. I catch a whiff of heaven. The human world is so endlessly ugly in its daily grind, in the lies of its politics, in its posturing and its poverty; so very ugly that I find myself pressed down by it all very often. So I look for the beautiful, and listen for it, and try to play it. When the sublime rushes through me, I hope that it is pure in some ultimate sense, and that it proves that life is ascendant. I want to discover over and again that life is divine. I am reasonably comfortable speaking to an audience, or was in the past, but playing a musical instrument in front of anyone gives me the heebie jeebies. Well, that’s not strictly true, I was once the leader of a Ukulele Choir that had more than two dozen members. (I like the idea of an instrument that you measure by the dozen – like bread rolls, or fruit!) The Ukulele is such a friendly and forgiving instrument, and we had enormous fun in our choir; a big audience didn’t faze us at all … much. But these days I am playing serious music, because I am a student at the Murray Conservatorium. Initially I made the mistake of thinking that a rural music school claiming to be a Conservatorium was a bit high handed, but I was entirely wrong. There are more than 600 students at ‘The Con’, and the teaching staff are musicians of the highest calibre who perform all over the place. Graduates from here regularly go on to study at the Sydney and Melbourne ‘Cons’ and become professional musicians. It’s a great place to go every week! My teacher says we are studying Baroque Recorder, which I think distinguishes us from School Recorder. I imagine that’s the idea, as the humble recorder has a rather hackneyed reputation. It’s a great mistake to undervalue the recorder: the 400 year old Baroque Recorder is an incredible instrument capable of playing the most challenging repertoire from every era. It is chromatic, complex and nuanced. In lessons we play duets by Bach, Vivaldi, Corelli, Telemann and others, and it’s as demanding as anything could be, and beautiful and exhilarating. Earlier this evening I was playing at the Murray Conservatorium in in front of a small audience, but an audience of considerable talent. The concert was for those who had written a piece of music for performance (which I had!). The opening piece was written and performed by a high school flautist who will doubtless go on to far greater heights. She was accompanied by a young man of the same age, who played a complex piano accompaniment with great panash. Her piece is to be her scholarship audition in a short while, and it was just dazzling*! My Shakuhachi (strictly speaking a Hochiku, a sub-species), a real treasure! My much shorter piece was titled Bamboo, which is good because you don’t really expect bamboo to dazzle, do you? Bamboo can just be its unique and unsymmetrical self, it’s appeal is simplicity; calming and sedate. More earth-honest than all those fancy orchestral instruments! That’s the conclusion I reached while the school students were offering their considerable musical talents. A few days ago I was practising my piece, Bamboo, on a piece of bamboo. Instead of recorder I had written for Shakuhachi, and end-blown Japanese flute that is literally a couple of feet of bamboo with five holes and an angle cut on the top to create a ‘blowing edge’, known as the urugachi by the shakuhachi literati. While practising I lost concentration as a vision of the upcoming performance crept into my thoughts, and my hands began to shake so much that I had to put the instrument aside for a while before I could play properly! My Baroque Recorder teacher was my accompanist this evening, playing tenor recorder. He is a terrific musician, in demand as a performer here and overseas, and is actually the head of the conservatorium. I’m very privileged to be studying with him, and to have him as my accompanist for Bamboo. When our turn came we sat down out the front and tuned (not that you can really tune a piece of bamboo …) and I said under my breath, “you know they are looking at us”, which he kindly repeated to everyone in his big, confident, boss-of-the show voice. I stayed up till midnight tonight to write this all down (after staying up till 2 am last night worrying about performing) because I need to tell someone how ridiculously satisfied and rewarded I feel; how deeply peaceful and purposeful such a moment can be. The performance wasn’t perfect, but neither was it a flop. It was modestly good I reckon, and the seasoned musicians in the audience were genuine and appreciative in their comments. Gosh, it was a thrill! From the weeks leading up to the concert, refining my simple composition, through to the intense preparation for a single recital. It was an experience that seemed to embrace all of my physical, emotional and spiritual being. And again I feel so very fortunate. I am grateful for a field of endeavour, something delightfully consuming, somewhere to point my own small boat. * I wrote this essay on November 11th, and since then we have attended another concert where a composition by the same young student was performed with a full orchestra, herself as flute soloist before returning to the percussion section for the rest of the concert. Quite a talent. As always, please say hello!